We have partnered up with our friends at True South Relief Fund to host a benefit for Mike Hutton. Mike was recently hit by a drunk driver while on his motorcycle and was left with 14 broken ribs, a broken right wrist and collapsed lungs. While in the hospital for his recovery he had to be placed in a drug induced coma to help with his injuries. Even though he does have health insurance the costs of staying in a hospital for a month and being out of work for an extended period of time can drive up a lot of debt. In an effort to help out Mike and his family in their time of need we will be having a day only $100 flash only tattoo day. There will be plenty of designs to choose from as well as artists like Angelo Miller(Inksmith & Rogers), Nick Colella(Great Lakes Tattoo), Nikki Balls(Tattoo Paradise), Tomas Garcia(Old Soul Tattoo), Matt Knopp(Tattoo Paradise), Christos(Wild Zero Tattoo), Billy White(Red Rose Tattoo) as well as the Tattoo Faction Crew on hand tattooing from 12pm to 8pm on Decemeber 3rd. This event will take place here at Tattoo Faction. For those who want to donate but may not be into tattoos, we will have plenty of raffles and auctions going on featuring original artwork, prints, shirts, gift baskets and gift cards to many local businesses. We will have our friends in Old Heavy Hands coming in from Greensboro North Carolina to play an acoustic set for some entertainment. If you just can't make it to the event but would like to donate please send a donation via paypal to "mikehuttonfund@gmail.com" or you can come by Tattoo Faction any time and make a donation in person. If you haven’t heard by now, one of our own at Tattoo Faction was in a devastating motorcycle accident. Mike Hutton left the shop on Friday evening to head home. After stopping at the grocery store for his family Mike was heading home when a drunk driver darted out in front of him from an adjacent pitch black street next to a bar. In an attempt to dodge the vehicle, Mike laid his bike down and would have walked away from the incident virtually unscathed. However, the driver attempted to flee the scene and ended up running over Mike with his front wheel of his car leaving Mike crushed and trapped underneath the vehicle. Fortunately, the patrons of the nearby bar fled outside and were able to flip the car over, off of Mike who was trapped beneath the vehicle. EMS was called and were able to get Mike to the hospital where he is now in critical condition. 14 broken ribs, a fractured wrist, and 2 collapsed lungs has Mike currently in a medically induced coma to help expedite the healing process. For those locally that wish to donate in person. Tattoo Faction will be taking donations in the form of cash or check, checks are to be made out to “True South Relief Fund”. Please feel free to stop in during our normal store hours, 10am-11pm Monday thru Saturday and Noon-6pm Sundays. TATTOO FACTION 10 YEAR ANNIVERSARY PARTY!!! Friends and loyal customers, we would like to invite you to join us on Sunday September 4th to celebrate our 10 year anniversary! Aside from our normal artist line up we will have some amazing guest tattooers joining us from all over! There will also be plenty of food and beer to go along with the planned festivities. Stay tuned for more updates as the date draws near! Here are the upcoming Holiday hours for the shop. 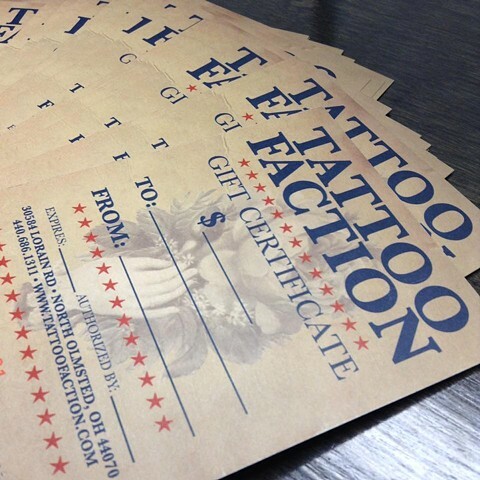 So stop on by and pick up a last minute gift certificate or even that new tattoo you've wanted before the years over. As always we thank you, our loyal customers for your continued patronage and we wish you a happy holiday! Christmas Eve - 10am - ? New Years Eve - 10am - ? We've got some fresh newly designed gift cards available. They're available in any dollar amount necessary and make great gifts for the holidays. Stop in and pick yours up today! We will be open normal hours on Wednesday and closed Thanksgiving Day. Shop hours will resume as usual on Friday the 27th. Chad Koeplinger will be tattooing with us here at Tattoo Faction Wed. June 10th and Thur. June 11th. He has limited availability. Please e-mail him at adventure tattoo@gmail.com for appointments. Matt Knopp from Tattoo Paradise will be here tattooing Thursday 05/14 - Sunday 05/17. Call the shop 440-686-1311 to setup an appointment.